In recent days we have had announcements from both the Royal Court and Michael Grandage of their upcoming seasons. Representing the very different ends of the theatrical experience for audiences; the small intimately thrilling Royal Court where so many of our great playwrights were given a space to write and the cavernous and wallet-sapping Noel Coward Theatre, the name alone indicative of its West End heritage. It is heartening to think of Grandage’s past as Artistic Director of The Crucible and a ten-year stint at the Donmar and realise that it is still possible to trace a line from the heart of regional theatre all the way to the money-making centre of the British stage. One might grumble about the prices of Grandage’s plays but it cannot be denied that a West End line-up containing two Shakespeare’s, a McDonagh and a new play by John Loga, whilst, maybe not groundbreaking, provides rather more interest than the usual fare of rehashed musicals, Coward revivals and vehicles for ageing American celebrities. Ticket prices may be steep at the top end but, as I have commented elsewhere, the £10 tickets actually undercut the National’s Travellex offer and, if star power is what you are after, provide fantastic value for money. Whilst advertised as ‘moderately restricted view’ I have found the seats to be absolutely adequate and you would miss virtually none of the action. Given they are available in both the Royal and Upper Circles they arguably offer better value for money than the Gallery tickets that are the next cheapest but are already edging towards an uncomfortable £27.50 for seats right up in the gods. This may be a last chance to catch one of the most interesting and innovative musicals in recent years. It sadly had the misfortune to go up against the Matilda juggernaut in all the major award ceremonies and as a result came home empty-handed but this tale, based on documentary footage taken from Ipswich in the aftermath of the discovery of five bodies in 2006 and put to music by Adam Cork, is one of the most complex and affecting new musicals in a long time. A real slow-burn hit, its success can be seen in the major summer revival it was given by the National just a year after it was first introduced. September is possibly the last time you will be seeing it in quite a while so go while you can. Whilst not to everyone’s tastes, a new play by Caryl Churchill is certainly not something to be ignored. One of Britain’s leading playwrights over the last 40 years and an icon for the current generation of female writers who grew up on Top Girls and Cloud 9, Churchill returns to the Royal Court with a new play, love and information. Details are scarce other but it looks likely that it will be a continuation of Churchill’s abiding fascination with non-linear story-telling and the use of the less naturalistic elements of theatre, as she creates a panoramic landscape of over 100 characters. Not one of Shakespeare’s best-known, best-loved or, indeed, best plays – Timon of Athens tends to labour under a difficult second-half and a lead character who goes out of his way to be hard to warm to. However of all his plays, Timon must have the most contemporary resonance; being a play of a society where wealth is all and where loyalty is only as tangible insofar as it can measured in gold, The Greek setting only lends extra hubris to the plot. Simon Russell Beale plays Timon and the Alison Jackman-inspired poster that shows him dining with a cross-section of English celebrity suggests that this may finally be the production that breathes new life into the play. Staying at the National, the great Fiona Shaw takes on Howard Barker’s Scenes from an Execution. Originally a radio play performed by Glenda Jackson in the 1980’s, Howard Barker is a playwright much feted in Europe and who hasn’t ever really gained the reputation in his own country that his prodigious output deserves. Coining the term ‘theatre of catastrophe’ to describe his work, Scenes… may help the ongoing reassessment of his work. How you feel about non zero one’s the time out is likely to depend almost exclusively about how you feel about participatory or immersive theatre. Personally I would rather chew my own fingers off then have to directly involve myself into a play – taking the more traditional view that I prefer to pay other people to perform for me than taking part myself. There is, however, a growing body – of mainly trendy young things – who do like this sort of thing so it is my responsibility to report it. non zero one walked off with the 2011 Off West End Award for Best Entertainment so it is undeniable that they are onto something with their productions. TR Warszawa is a theatre company that represent everything that separates UK and European theatre. Their last production at the Barbican was the brutally affecting revival of Sarah Kane’s 4:48 Psychosis and if their production of Nosferatu seems a little too tied to its Halloween dates, it is to be suspected that this Polish company will be approaching this tale from a radical new angle and will find ways to unnerve despite its over-familiarity. Possibly the most anticipated play of the entire Autumn Season is The River, Jez Butterworth’s critical and commercial smash, Jerusalem. 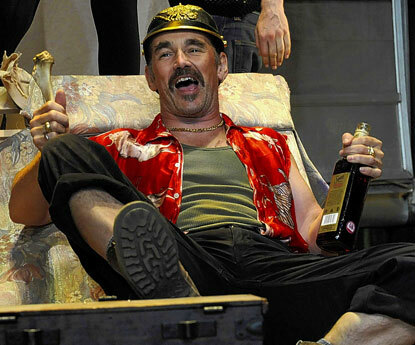 Butterworth’s Jerusalem, with a performance for the ages from Mark Rylance, confirmed that the potential shown with early work like Mojo wasn’t misplaced. Jerusalem is a play that towers over all other modern plays as its rhythm and vitality of language makes it one of the rare plays that does not shy away from confronting the Shakespeare colossus that seems to make many writers shy away from attempting the epic. It not only confronts Shakespeare but at times it stands as equals. Butterworth’s follow-up will be watched with keen interest, and in a canny move to beat the touts, the Royal Court have announced that there will be no advance tickets for The River, and will instead be released on the day of the performance. The labyrinth where night is blind.